“How long do souls linger by the side of their bodies? Human Acts tells the story of the South Korean student uprising and subsequent mass murders of Korean people by a corrupt government. While the story is fiction, the premise of the book is based on factual historic accounts of that time in the 1980’s. Our story follows a young man, Dong Ho, as he is brutally murdered and friends and family try to cope with not just the loss of Dong Ho, but also trials of the time they live in. This is a tragic story of brutality and a corrupt people, and also the South Korean people finding a place and a voice. My thoughts: I personally knew nothing of South Korean history and have never been interested in it. This is not a book I would have read on my own. At times gruesome and disturbing, Human Acts asks the main question, Why do humans kill humans? I did not appreciate Dong Ho’s POV. It was very distracting, the character constantly being referred to as “you”, which stole from my reading experience. While I love to completely dissolve into a story, the author’s choice of POV in the very first chapter, no less, kept me very aware of myself and thus, confusion ensued. I also found it hard to thread out the current plot through the multitude of flashbacks that, in my opinion, were not necessary to the plot, nor were introduced well. In addition, the Korean names are very unique and at times, quite similar to each other, and pared with under developed characters, I had a hard time not just distinguishing between characters, but also caring about anything that happened to any of them. This was a hard read, but I believe what made it difficult was its raw humanness, the un-paralleled battle between good and evil and how we can carry out either on another person. A very disturbing book, one that I do not recommend if you have a sensitive pallet. “This book was originally published in Korean as ‘The Boy is Coming’, in 2014 by Changbi Publishers, Inc” -Title Page Verso. “Like a lot of people, I wonder what I would do in the last few moments of my life. If a gun were pointed to my head, would I still say I believe in God? 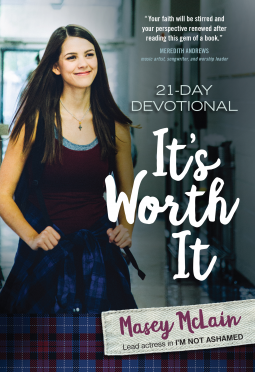 I believe Rachel was able to say yes because she’d gotten to a place in her life where she knew he was worth it. The world left her empty, but Jesus satisfied her soul. He was everything to her.” -Masey McLain, It’s Worth It. The people of Sweetwater, Texas are trying to figure out normal life after the war between the states has ended. For a few, legend and memory haunts them like recurring nightmares, for others, the absence of so many people once loved is felt strongly, and their hollow places must be filled. For Sergeant Thomas Baker, an unsung war hero turned convict, life had left him as a broken shell of a man, until strong friendships formed in a Union prisoner of war camp made him realize though, even if he was not a good man, an Almighty God might just spare enough time for him, and that was enough. He never hoped to have the things other men he admired had, only to find a simple life of loyalty to his friends. That is, until he met Miss Laurel Tracy. Laurel, recently orphaned by war and sickness, has been graciously willed Red Roan Ranch in her parents wake. Her step siblings also reside there with her, though offer no help in the running of the ranch. Desperate for help in the keeping, as well as protecting of the ranch from squatters, Laurel is forced to do something drastic. She buys local convict Baker on a one year lease, to help her efforts in running the ranch. Both Thomas Baker and Laurel Tracy are fiercely independent and equally overlooked by society. Can they overcome prejudices and ban together to fight for the safety of the ranch? At times, I found the romance was a bit forced, however Sergeant Baker is a forceful man. It is evened out by his counterpart, Laurel, who is the true light to his dark. Where life and war has made Baker a hard, yet truthful man, society has made Laurel skeptical and gentile, and we get to witness the internal war of each heart, the constant struggle of love and self-doubt. I found this to be a refreshing lactose-free novel, Christian fiction without the cheese. Shelley Shepard Gray doesn’t seem to hold back the gritty truths of hard southern living mixed with the realities of war against your own countrymen. She displays human emotion without interfering with the integrity of each character. The setting is so vivid and unique, I felt as if I was getting a real look into the remains of tattered lives, beaten and broken and then hardened by war. I loved each unique character’s point of view, the voices and local color were so strong and captivating that I had a hard time putting it down. I look forward to reading more of Shelley Shepard Gray’s novels. An Uncommon Protector will be available for purchase on February 7th, 2017 from Zondervan Fiction. Gray is the author of many best sellers, including Deception on Sable Hill and Secrets of Sloane House. 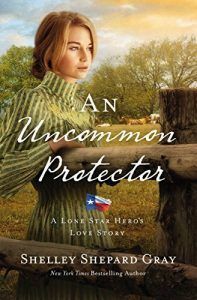 An Uncommon Protector is a part in a series A Lone Star Hero’s Love Story. Visit Shelley Shepard Gray’s website here: http://www.shelleyshepardgray.com and find her on Facebook: http://www.facebook.com/ShelleyShepardGray. I was given this book to read in exchange of my unbiased personal review. All opinions are my own. Have you ever read a book, and then wish that you could un-read it, just so you could have the precious experience of reading it again for the first time? This has happened to me with a handful of select books, and I can now add C.L. Denault’s Gambit to that illustrious list. If I had to describe Gambit, this is probably how it would go: Imagine if The Hunger Games, Divergent, and Shadow & Bone had a love child. er…book… That love child/book would be Gambit. Does that mean this is just a top notch hack? Absolutely not. Gambit can definitely stand on its own two feet…er…never mind. In Gambit we find a very unique setting. There are cities called Core’s, and then there are outlying lands surrounding the cities. Even though the story takes place in the future, whats so unique is that only the cities have technology of any kind. The farther you get from the Core, the more rustic and primitive the people are. The Core controls everything, which is not always a good thing, as they also experiment with genetics, creating inhuman killing machines and genetically perfect people. When we meet our main character, Willow, we find her in the outlying lands, and honestly, it seems like we are in 1700’s Scotland. Denault’s writing is so precise and vivid, she paints amazing imagery with her words and you really get a picture of Willow’s world. To add on top of the uncommon setting are the skills that some people have. These skills are uncovered after they go through a type of sickness called The Surge. These skills range through a variety of types of things, from being able to detect other peoples skills, to being able to hit a target, every time. These skills are in your DNA, and if you have a skill, then The Core wants you. This is not always welcome news for the people of the outlying lands. We follow Willow as she discovers her own skill, and her journey into the Core. Gambit is a fast paced story that seriously leaves you turning every page as fast as you can. If you’ve read The Hunger Games, then you will recognize the zingers that are at the end of each chapter that leave you saying to yourself ” just one more chapter” until the whole book is finished and you are now suffering from massive book hangover. Gambit has multiple plot twists that I personally never saw coming, yet when they happen, it makes complete sense with the story line. (THAT’S a talented author) I found Willow to be very relate-able, even though she has what some would call supernatural skills, she’s also very vulnerable and has anger issues that are hard to control. Is it just me that doesn’t like their characters to be picture perfect?? Gambit leaves you at the end not knowing who you can trust, just as Willow herself feels. I personally give this book 5 stars. I am having a hard time being patient for the sequel 😀 Have you read Gambit? What are your thoughts?